Well, yesterday was surgery day! We arrived at the Interventional Radiology Department of the hospital at 6:30 a.m. We were met by a nurse to take down a bunch of info, an Anesthesiologist and his resident, Cannon’s surgeon, and the Radiologist. After all of the appropriate introductions were made, game plans had been discussed, questions were answered, and consent forms signed…. I carried him into the room where it would all go down and he was quickly masked by Anesthesia. Then, we were shown the waiting room. His surgeon would be up first. To remove (cauterize) the very vascular and pesky granulation tissue that has been driving us crazy. This went well and she came and talked to us when finished. She explained that the hole where the Mic Key Button was is bigger than it should be. She thinks this is because the protective band he has been wearing is snug. A little too snug. And she assumes it is putting pressure on the button and causing the hole to erode even more so. Which isn’t the greatest news as we already knew that the Chait Button requires a smaller hole and that there would be leakage until the hole healed around the new button. Now, it would take a little longer perhaps. Boo! She also removed the “old” Mic Key Button before leaving. The Interventional Radiologist was next to do his thing. Which was to place the new Chait Button in a unique way. His cecum had already been attached to the abdominal wall in his last surgery so that didn’t need to be redone. 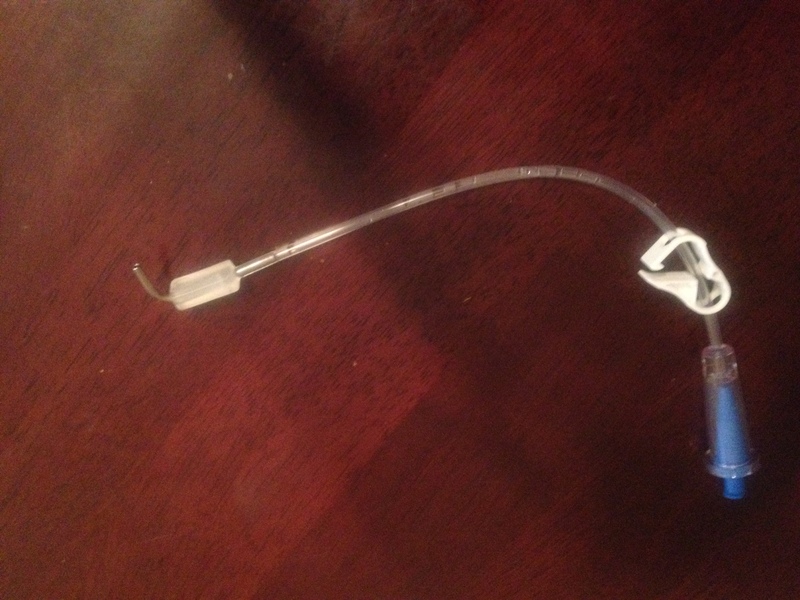 So Friday, they threaded a catheter with a wire inside through a special hollow needle into the cecum. 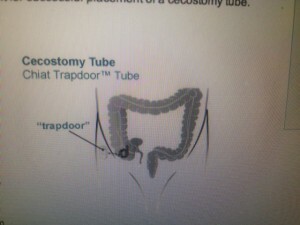 Placement was confirmed through the injection of contrast dye through the catheter and by using live x-ray to make sure the dye travels into the cecum. When all is in place, they pull the wire out and the tube coils inside him. Cannon was now taken to the PACU (Pediatric Acute Care Unit) to recover. We were escorted to that waiting room but they were already calling for us to go back and be with Cannon. Who was already awake and MAD! I was shocked as he usually takes forever to wake up from anesthesia. But man, was he MAD! He screamed so much that they had to move him to a private room within the PACU as opposed to the curtained off area he was in. He was upset to have the IV and Pulse Ox on and some other sticky monitor pads that remained from the procedure. And he wouldn’t calm down until all of those were gone and all medical staff had left the room. Then, he wanted to snuggle and watch a movie. So, the portable DVD player was pulled out and turned on to a favorite. And his Curious George and blanket were snuggled in tight with him on Mommy’s lap. After he proved he could drink juice and not get sick. And the button’s site was rechecked…..we were allowed to leave. Can you believe it? We put this risky, big deal of a thing in his body and could leave on the same day! Crazy! We did have to go by the surgeon’s office so that the Nurse Practitioner there could train us on how to use the new button. The ingredients in and general idea of the flush are the same but the design of the button is quite different. This one is smaller, more flush with the skin, and has different mechanisms. 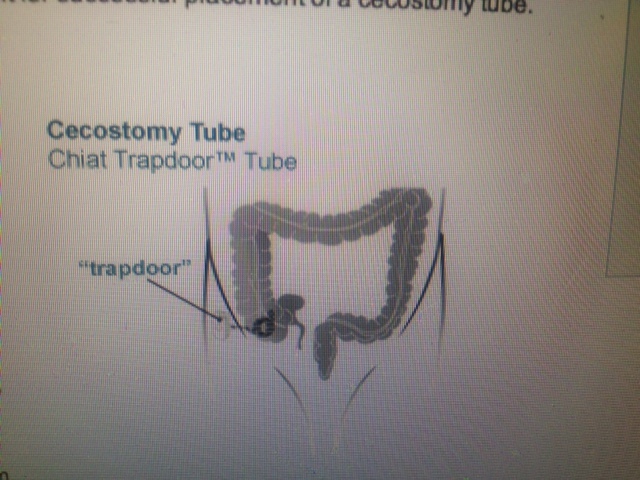 The connecting tube is also very different. The design is making it difficult in the short term. For a couple of reasons. The first is back to the issue with the hole. Because we put the Mic Key in first and the hole for that is bigger than that is necessary for a Chait….there is some healing that has to happen before the button won’t move around and try to come out slightly. And leak! Eeeeeewwwww! Also, this button is designed to last for a year. So, the trap door needs to last and hold for that long. So, right now…..it is like a fortress! It is darn near impossible to open! You have to hold the very small button down against the skin and pull carefully but so so hard with your other hand to get it to open. As soon as it opens it begins to ooze. And you have to insert the connecting tube. You really have to kind of jiggle it to get it in right. And that is tough with the hole around the button being too big as well. Anyhow, the tube looks like this….. So, this morning Mark and I set out to perform this on our own. It had already been and would continue afterwards to be a really tough day. Cannon is in all out “fight or flight” mode. He is nervous, anxious, and acting out tremendously through his Autistic symptoms. He cannot stop scripting (repeating memorized phrases that have nothing to do with anything nor what is going on at the time), picking at a scab on his finger and the skin on his lips, reacting VERY emotionally to everything, and throwing things. The first few can be somewhat normal but not the last. So, the flush was not going to be pretty no matter how hard we tried. But we had to do it. So, we laid a very mad and aggressive Cannon on our large, square ottoman with a towel draped over it. Mark knelt next to it and pulled Cannon towards him in an attempt to pin his legs. I held his arms and upper body and try to help with the clamp when I could. Mark began what turned into a more than 7-8 minute attempt to get the button open. All the while, Cannon is screaming at the top of his lungs and kicking him as hard as he can in the groin. He had to stop a few times to gather himself. The button was moving all around and oozing like crazy. I am beyond proud of my husband for staying calm and getting the job done. When he finally got it open, it was such a relief. But he had to quickly get the tube in as it began oozing even more. That wasn’t immediate either. He jiggled and jiggled before the metal piece finally caught right and was in. The catheter syringe was connected and I undid the clamp for him. The solution began going in. Another difference is how much smaller the tube is than the Mic Key. So, the solution pushes A LOT slower. Very slowly actually! 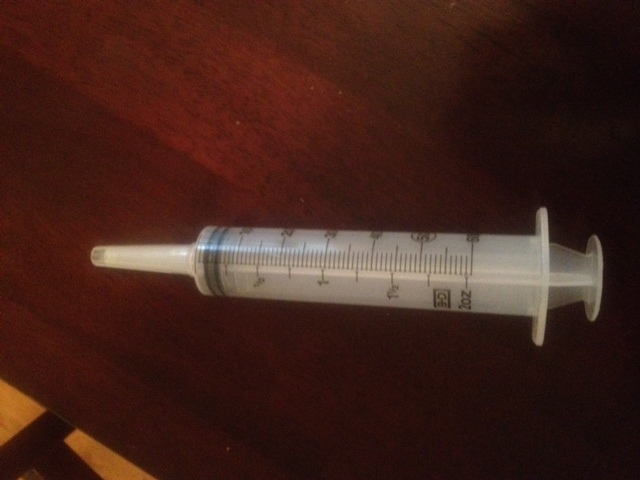 And you have to clamp and change syringes while adding another at one point as well. At the end, everything is disconnected. Which is no cake walk either. 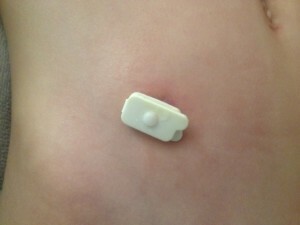 It is really difficult to jiggle out the tube and then get the button to close all the way. Finally, we rush him to the bathroom and still have “the results” to deal with. For about 15 minutes, he screams because the solution makes him cramp so. Today, we were so spent physically and emotionally by the time we even got to the bathroom…..we lost it. Mark buried him face in Cannon’s back and I was sitting at his feet sobbing into my hands. We are supposed to be strong for him but we are human. And this was so so hard. We were drained. And of course, at that point, he began to pee…..on both of us! Sigh. Thank you sweet Lord for loving and sticking with a weak servant like myself! Thank you for being my strength when I am weak! Thank you for your gentle spirit and for sending reminders to me of your presence and provision at the exact moment I needed it most! Blessed be the name of the Lord! Friends….specifically you Prayer Warriors…..we could use prayer for the fast healing of the hole around Cannon’s button and also that the trap door would wear enough soon that it will not require so much effort to open it. It cannot be comforting to our sweet boy to see us tugging at this thing with all our might. When those 2 things happen, life should be better. Oh and Mark is having the first of 2 knee surgeries on Monday. So, praying I can handle things somehow while he is down would be fantastic.